The Materials and Resources section of LEED v4 contains significant changes to the way that materials are evaluated in the LEED rating system. Specifically, the “Building life-cycle impact reduction” credit is the first incorporation of Life-Cycle Assessment (LCA) into the main body of the LEED rating system. What is Whole Building Lifecycle Assessment (LCA)? How LCA adds value for building owners? What does it mean for design teams? When should you start the process? 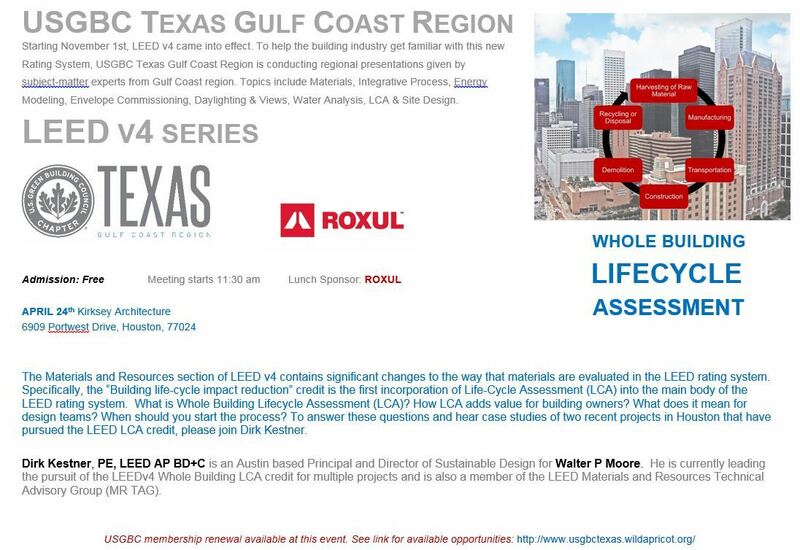 To answer these questions and hear case studies of two recent projects in Houston that have pursued the LEED LCA credit, please join Dirk Kestner.